I'm like the Human Torch: I'm burning through the Scott Pilgrim volumes so quickly. 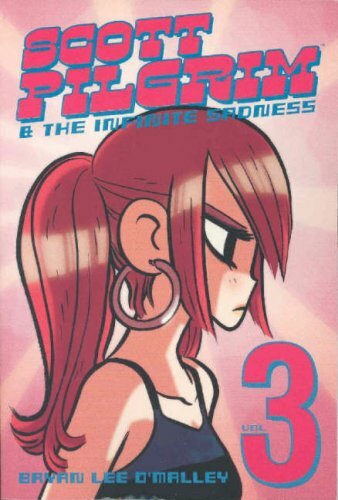 The third volume in the Scott Pilgrim 6 magna book series, Scott Pilgrim and the Infinite Sadness, is filled with yet more fighting, ex-boyfriends and ex-girlfriends, and random funny moments which continue to make Scott Pilgrim a fun filled and unique comic experience. As I touched on in my first Scott Pilgrim post, the books are small magna books which, besides the fact that I am sure they turn regular comic readers away, seem like they would be super-quick reads. The first volume may have read really quick, but by the time you get to the comic of the day Scott Pilgrim and the Infinite Sadness, you'll realize the book is taking a bit longer to finish. That is a lesson I fully comprehended at 1:30 at night. It isn't that the book drags or anything, I just think there is literally more to read and comprehend. Thinking takes time! How does Scott Pilgrim have so many ex-girlfriends? He seems so stupid at times and other time so lackadaisical one wonders what a girl would see in him. He also has no job, lives in a one room apartment with a roommate and is broke. The only thing I can think is that girls think the awkwardness he exudes is cute. That, or girls just like the guy that ignores them or seems like they do not care as much. One guy strategy for getting chicks to like you is to ignore them. If you seem like you have other things on your mind as apposed to a certain girl that girl may find it a challenge to get into your life. The adventure that is "the guy who isn't all about them" may seem desirable. In the lyrics of New Found Glory, Scott Pilgrim's for "stupid girls, who think that every boy is all about them."